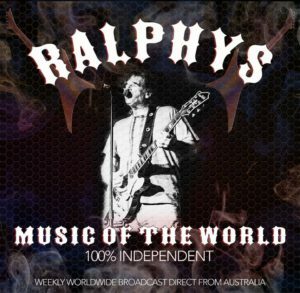 Ralphy’s Music of the World is not just my Radio Show. It features independent Artists from my private Music Network, where I Help connecting Musicians with my over 100 Station Friends around the World as well. I have my own Rock Band, As Crows Fly, and as a Musician, I am not restricted to serve one Master. As Crows Fly Supports the Independent Scene and has Helped Local and Overseas Musicians receiving not only Exposure via my Shows, but also the Live Global Radio Concerts I am organising.